Becki joins me as our resident Marfy Pattern expert and of course I will offer up tips and pointers on fitting Marfy patterns, in case you want to join the fun. Pattern Selection: Each month, we will select two different Marfy patterns, that we each would like to sew. They may be from the Marfy online website at Marfy.it or from one of their mail order catalogues. 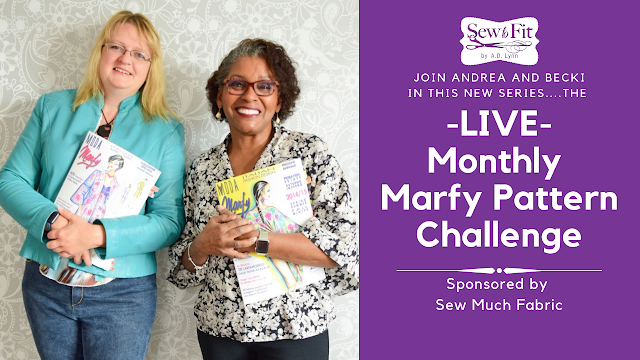 Voting: During the live webcast, you will vote via a live poll on my YouTube channel, SewTofitbyAdlynn, for ONE of the two we select as our challenge garment or outfit. We will then have until the next show, to sew the garment for reveal in the next months Live Webcast. If you can't catch the Webcast Live, it will still be there for you to watch the fun, although, voting will have ended. If you want to stay up-to-date aside from this blog, please feel free to subscribe to my Sew-To-Fit Newsletter. It has been hard for us to narrow down our choices to just two patterns for you to vote on. Let me tell you there are a large, wonderful, selection!!! Please join in the fun...and see what we make. Love your site! I am getting back into sewing and always wanted to try a Marfy.... Do I order size by high bust measurement or full bust measurement like as shown on the Marfy site. I've been told to order by high bust so it fits the shoulders and upper back and then do a full bust adjustment as needed for my D size cup. See my latest post about the fit. This was my first time sewing the pattern from the challenge. In this first episode I did have some issues with the fit.